I feel like there are issues that need to be addressed concerning giving. I know that there are a lot of scriptures that talks about giving and how God will bless us more and more when we give. The preaching of these scriptures have cause many to give only because they want more and more blessings. This brings us to the question, why should a Christian give? Is it just so he could get more and be blessed financially? “And if you lend to those from whom you hope to receive back, what credit is that to you? For even sinners lend to sinners to receive as much back.” (Luke 6:34). If you give only with a desire to receive back in excess are you different from a business man. Is Christianity some kind of business investment where you put some money just so it can double or triple within a period of time. The is the mind set that many Christian carry, they have taken the attitude of a business man, demanding that God multiply every money they invest. This is not Christ at all, Christ doesn't give in order to receive in multiplus. But God give because of love. "For God so loved the world that He gave His only begotten Son," (John 3:16). God love and so He gave. This is what Christianity is, it is giving out of love. Love always give and we are born of love; our Father is love (1John 4:8). As children of love it is in our nation to give. 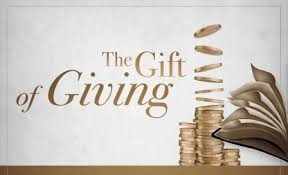 We do not give because our pastor told us and showed us in the Bible that when you give you will receive in multiplus. That is a business man mindset and it is carnal. We give because it is who we are. We love to give, we feel more happy and blessed to give. "And remember the words of the Lord Jesus, that He said, ‘It is more blessed to give than to receive.’ ” (Act 20:35). That smile that it brings, that joy in people's face when we give, that is all the blessing we seek. The joy of seeing people bless through us, that's what we are after. To see death being defeated; that depression, anger, frustration and pain that comes with lack and poverty. To see these darkness being defeated is just enough. It makes us want to have more so that we can give more. And of course our faithful Father sees our hearts and gives us more. I have seen people give and give but it seem like God is not multiplying their giving. It is because their heart condition is all wrong. They are greedy and they only give because they want more. Let us learn to give as a Christian; give with the desire to see people smile, to see others being blessed. Seek for the joy of seeing people blessed through you and God will bless you with His riches as you continue to spread life and bring light into people's life.